Big rigs are not known for being fast, or fuel efficient, and the engineers at Volvo apparently viewed that as a challenge. 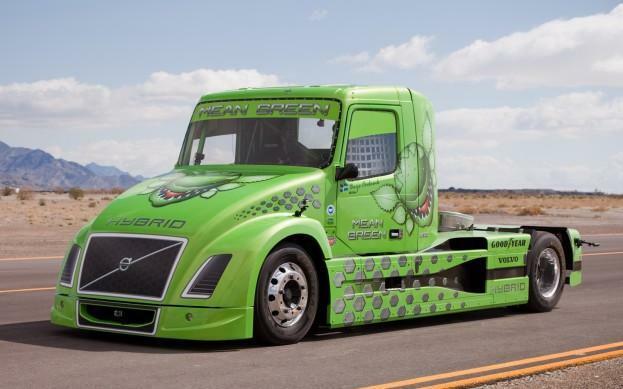 The Swedish company built a one-off diesel hybrid truck, nicknamed “Mean Green,” that recently set a world speed record. At 236.5 kph (147 mph), this is the world’s fastest hybrid truck. The record was certified by the United States Auto Club, a division of the Fédération Internationale de l’Automobile (FIA), the international sanctioning body for auto racing. Admittedly, there are not many other hybrid big rigs around; Mean Green was actually racing itself. The truck set the previous world record, 135.9 mph, in June 2011 at Hultsfred Airport, Sweden. Still, getting a big commercial truck to go 147 mph is a pretty impressive feat. To get Mean Green to achieve those speeds, almost every aspect of the truck needed to be modified. A quick glance reveals that Mean Green is no ordinary truck; the bodywork was completely altered to make it lighter and more aerodynamic. Nonetheless, Volvo says the chassis underneath the slick body is from a stock VN tractor. Mean Green’s powertrain is definitely not stock. It consists of a diesel inline-six engine and an electric motor. The system produces a combined 2,100 horsepower and 5,000 pound-feet of torque. The electric motor alone produces 200 hp and 885 lb-ft. Mean Green is an impressive machine, but why do through the effort to build it? After all, most truck drivers don’t break speed records. This particular truck won’t be in showrooms soon, but its development gave Volvo a chance to dabble with hybrid powertrains. “Mean Green’s incredible performance underscores the strong potential of hybrid drivelines when applied to the right operation,” said Ron Huibers, Volvo Trucks president of North American Sales & Marketing. If a hybrid is durable enough to set records, it should be durable enough to haul freight. Right now, Mean Green is more of a publicity stunt than a business plan, but hopefully that will change. Long-haul trucks ply the world’s roads even when commuters are asleep, so reducing trucks’ emissions and fuel consumption could make a big impact. After all, almost everything travels on a truck at one point. Those trucks don’t move as fast as Mean Green, but the concept is still the same.